NEW YORK (AP) — Apple trotted out few details on its long-awaiting streaming service on Monday, but it didn’t skimp on high-wattage celebrity. Oprah Winfrey, Steven Spielberg and Jennifer Aniston were part of a parade of A-listers who took the stage at Apple headquarters in Cupertino, California, where the main attractions are usually the company’s latest high-tech gadgets. This time, though, it was the likes of Big Bird and Aquaman himself, Jason Momoa, who took the spotlight at Apple’s latest live-streamed product launch. Apple chief executive Tim Cook gave what he called “a sneak peek” of the tech giant’s plans to transform television viewing and jump — some analysts say belatedly — into the streaming business Netflix has pioneered. The service, dubbed Apple TV Plus, will debut in the fall in more than 100 countries and feature ad-free original series and films. Cook and Apple declined to say how much the nascent streaming service will cost. 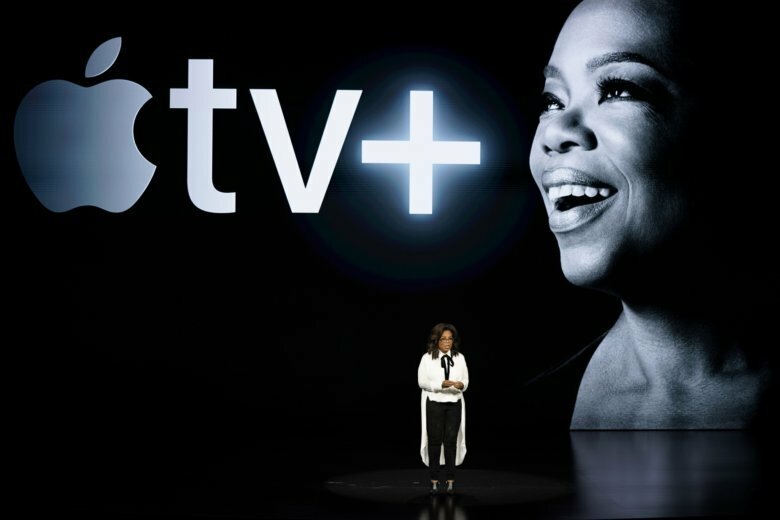 It was unveiled as an extension of Apple’s redesigned TV app, which will bundle third-party services like HBO, CBS and Showtime, along with a user’s cable subscription and some streaming services like Hulu. Netflix has said it won’t partake. Much of both Hollywood and Silicon Valley had eagerly awaited details on Apple’s much-ballyhooed foray into original programming, something the company had been quietly prepping for the last few years — and laying aside at least $1 billion to do so. But it’s not the only company readying a rival to Netflix, which spent $12 billion on content last year. The Walt Disney Co. and AT&T’s WarnerMedia are both set to unveil their own platforms later this year. Standing out from the pack will be a challenge for each. Disney’s streaming service, named Disney-Plus, even bears a plus-symbol just like Apple’s service. “It’s not just another streaming service,” said Zack Van Amburg, who along with Jamie Erlicht was hired away from Sony TV to head Apple’s video programming. Cook didn’t map out how extensive Apple’s streaming library will be; it has about two dozen series and a handful of movies in the pipeline. But he promised big ambitions. “We partnered with the most thoughtful, accomplished and award-winning group of creative visionaries who have ever come together in one place, to create a new service unlike anything that’s been done before,” he said. — Oprah: Winfrey said she has two documentaries in the works for Apple TV Plus (one on mental health, one on the toll of sexual harassment in the workplace) and is planning “the most stimulating book club on the planet.” The TV personality, whose book club choices have made dozens of works into instant best-sellers, said the Apple broadcast will include streamed conversations with authors. Winfrey already has her OWN network and “O” magazine where she still makes book picks, most recently Michelle Obama’s “Becoming.” ”I am proud to be a part of this platform where I can connect with people around the world to create positive change,” said Winfrey. — “Amazing Stories”: Executive produced by Steve Spielberg, “Amazing Stories” is a science-fiction anthology series the filmmaker is reviving. It first ran for two seasons from 1985-1987 on NBC. “We want to transport the audience with every single episode,” said Spielberg. — “The Morning Show”: Aniston, Reese Witherspoon and Steve Carell star in this series about the behind-the-scenes drama at a TV morning show. Witherspoon said it will “pull back the curtain on men and women in the high-stakes battle of morning television.” It is, notably, Aniston’s first time back in television since “Friends.” ”And I’m really excited about it,” she said. — “See”: This post-apocalyptic series stars Jason Momoa and Alfre Woodard takes places centuries after a cataclysmic event where all of humanity has lost its sight. Other shows in development include the thriller “Defending Jacob,” in which Chris Evans plays a father whose 14-year-old son is accused of murder; an untitled drama from M. Night Shyamalan; a series from “La La Land” director Damien Chazelle; a show about computer coding for preschoolers called “Helpsters,” with Big Bird; a drama series about youth basketball produced by Kevin Durant; “Dickinson,” starring Hailee Steinfeld as Emily Dickinson; and “Little Voice,” a show about a young musician produced by J. J. Abrams and Sara Bareilles, who performed the theme song Monday. Apple’s nascent movie aims were harder to discern Monday. It previously entered into a partnership with A24, the indie label behind films like “Moonlight” and “Lady Bird.” Their first film together is to be “On the Rocks,” Sofia Coppola’s reunion with “Lost in Translation” star Bill Murray. He plays a larger-than-life father reconnecting with his daughter, played by Rashida Jones.